This is a great couponing trick I learned a while back. I was standing in line at a local Michael’s craft store getting ready to pay for my items when a fellow crafter waiting ahead of me turned around and handed me a 50% coupon from AC Moore. I was a little confused since the AC Moore in our area recently closed until she enlightened me that Michael’s accepted competitor’s coupons. I was already aware of Michael’s usual 40% coupon (on regular priced items) in their weekly ads but I certainly appreciated that fact that I could save a little bit more. After that serendipitous encounter I always look online and compare the the coupons of several craft stores for the week and use the better coupon to save a little extra. 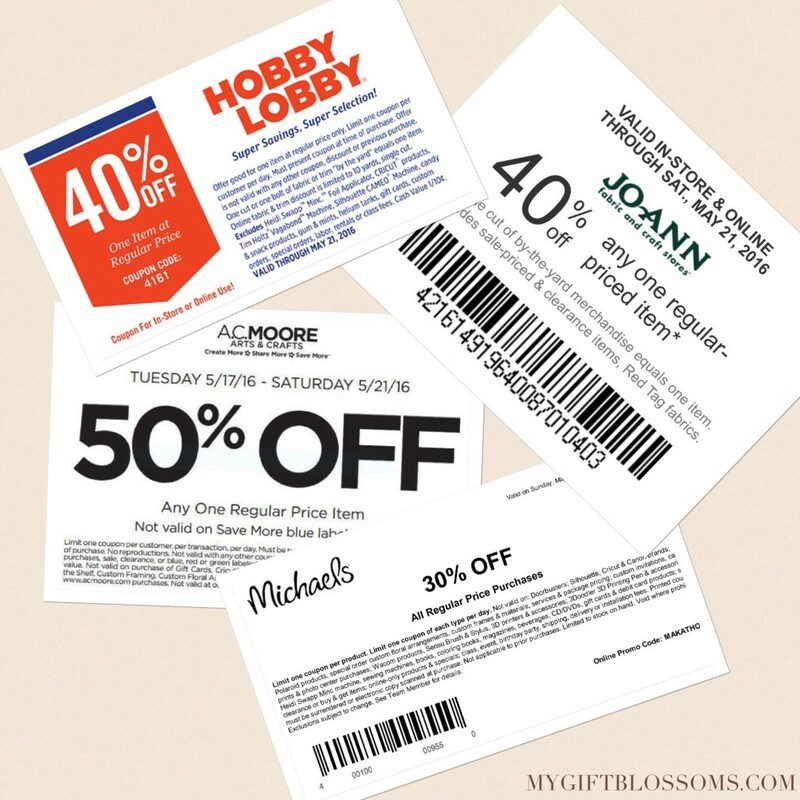 Above are the weekly coupons offered by Hobby Lobby, Jo-Ann, Michael’s and AC Moore that are good for this week. As you can see AC Moore is offering the most savings with 50% off on regular priced items. 50% is a huge savings especially on high priced items and i consider anything above $10 a high price item when it comes to crafting supplies. I’m very excited on using this coupon at Michael’s to buy a heat gun I need for a future DIY project. This tip has been really helpful in saving me extra money. I’m happy to pass on it and hope it helps others as well. Please let me know if there other craft stores that offer weekly coupons. One Response to "Couponing Tip: How to Save More Money on Your Craft Supplies"